Create the environment for hair to grow. For 20 years, Dr. Lawrence Samuels has been providing innovative skin care solutions through his Rx Systems PF® line of cosmeceutical products. Rx Systems PF® was established in 1996 by Dr. Lawrence E. Samuels, a board-certified dermatologist who saw the need for skin and hair care products that were easy to use, affordable and effective. Dr. Samuels developed the Rx Systems PF line of skin care products – a complete line of pH-balanced, glycolic complex-based products, retinols and moisturizers for the face and body. 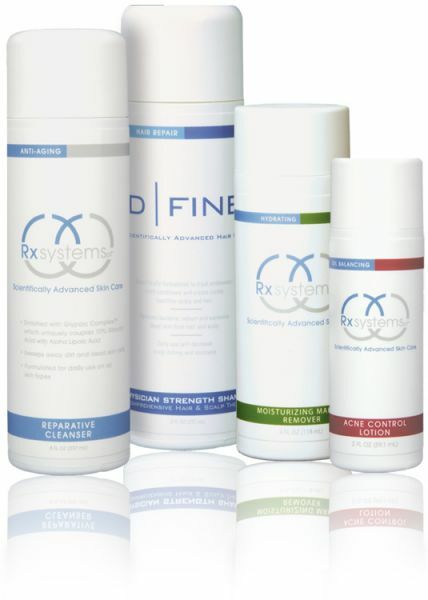 Rx Systems PF products are sold at selected retailers nationwide and online at www.rxsystemspf.com. Formulated for fine, thinning or chemically treated hair. An 8% Glycolic Acid formula opens up hair follicles by sweeping away oil, bacteria and dead skin cells from scalp and hair. Generates body and volume for visibly healthier, fuller hair. Formulated for all hair types, including chemically treated hair. Polyhydroxy Acid formula decreases scalp itching and scaliness associated with conditions, such as psoriasis, seborrhea and eczema. Sweeps away oil, bacteria and dead skin cells from scalp and hair. Formulated for daily use on fine, thinning or chemically treated hair. Improves overall body, thickness and manageability of the hair. Restores the moisture content and pH to the scalp and hair. Formulated for dry, damaged or chemically treated hair. Fortified with Keratin Amino Acids and Panthenol. Penetrates deep into the hair shaft to repair damaged keratin protein. A completely natural oral supplement formulated with essential Amino Acids necessary for hair, skin and nail growth. Rejuvenates brittle and thinning hair for a visibly thicker, healthier appearance. Promotes nail growth and strength. A completely natural oral supplement formulated to strengthen hair and nails and promote healthier skin and scalp. Improves skin’s elasticity, moisture and microcirculation. Fine and thinning hair is a common, often embarrassing condition affecting women of all ages for a variety of reasons. Heat styling and chemicals found in dyes and other hair products can cause dryness and breakage to the hair, while aging, hormonal changes, medication use and heredity can also contribute to fine or thinning hair in women. And although there’s no stopping the aging process or changing a person’s genes, there’s still hope. Dr. Lawrence Samuels, Chief of Dermatology at St. Luke’s Hospital in St. Louis, MO and founder of the skin and hair care product line Rx Systems PF, has formulated a line of hair volumizing products and supplements called D-Fine, available without a prescription, to repair damaged hair strands, deliver critical nourishment and moisture to the hair and scalp, and build healthier, more voluminous hair.